Description A Knight under Lord Barland. He is always conscious of playing the part of the model knight because of his lizardmen heritage and his desire to win glory for his kin. He is a little inflexible but an earnest and dependable man. Lusit's indiscriminate hospitality leaves a deep impression on Osvald, leading him to swear an oath to defend her as a Knight. He is extremely durable and boasts considerable physical strength, but he is weak to sudden changes in ambient temperatures. A Knight under Lord Barland. 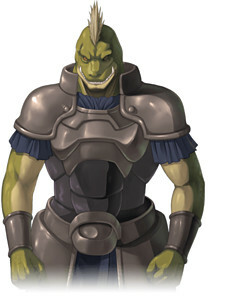 He is always conscious of playing the part of the model knight because of his lizardmen heritage and his desire to win glory for his kin. He is a little inflexible but an earnest and dependable man. Lusit's indiscriminate hospitality leaves a deep impression on Osvald, leading him to swear an oath to defend her as a Knight. He is extremely durable and boasts considerable physical strength, but he is weak to sudden changes in ambient temperatures. [Spoiler] Originally a monk, he witnessed the first hand the destructive effects of the narcotic "Scarecrow" on lives. Realising his prayers could not bring salvation, he took the spear and trained with the guards to take action against the epidemic. Despite prejudice, he earned the acceptance of the local community and his commitment to eradicating the "Scarecrow" menace eventually earned him a commission from Lord Bertrand. His time as a monk means his meals are always vegetarian, a fact which isn't immediately obvious as lizardmen are the archetype of voracious carnivores. For the children he managed to save from addiction, he continues to give alms to them as a matter of penance. A Knight under Lord Barland. He is always conscious of playing the part of the model knight because of his lizardmen heritage and his desire to win glory for his kin. He is a little inflexible but an earnest and dependable man. <hidden by spoiler settings> Originally a monk, he witnessed the first hand the destructive effects of the narcotic "Scarecrow" on lives. Realising his prayers could not bring salvation, he took the spear and trained with the guards to take action against the epidemic. Despite prejudice, he earned the acceptance of the local community and his commitment to eradicating the "Scarecrow" menace eventually earned him a commission from Lord Bertrand. Although Osvald succeeds in catching the merchant peddling "Scarecrow" red-handed, the organization behind its manufacture kills the merchant and burns the evidence. Despite the setback, Osvald vows to continue his hunt and remains a guild member with Lord Bertrand's blessing. "Damned straight! My flag is firmly planted now. The day is totally won"